Restoration and conservation of historical metalwork is a fascinating area of work, an intimate knowledge of traditional techniques is necessary, when restoring an historic item the original methods of manufacture must be used. For example, when pieces have to be taken apart or renewed if necessary - drawing the line between restoration and conservation can be a difficult one and needs to be treated sympathetically on an individual basis. 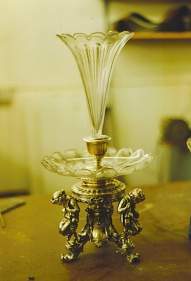 Silverware, from the most elaborate of centrepieces to domestic ware covering a period of the last 3-4 centuries to the modern day by many of the countries leading silversmith. The complete overhaul of an large chandelier for restoration house in Rochester, Kent.